1. Basic Search is a simple way to find what you are looking for in Literature Online. Basic Search searches across all content within Literature Online. You can also click the buttons for Criticism, Primary texts, Author pages or Reference works to focus your search to a specific content type. For more details about the Basic search feature, click here. For Criticism, click the Search criticism button to find Scholarly articles, reviews, books and dissertations. For Primary texts, click the Search Primary texts button to find original literary works of poetry, drama and prose. You can also search poetry, drama and prose specifically. For Reference works, you can browse the book carousel to find highlighted encyclopedias, companions, dictionaries, biographies and study guides. For Authors, you can browse the carousel of frequently viewed authors, or click Browse authors by literary period, literary movement or name to find any author available in LION. 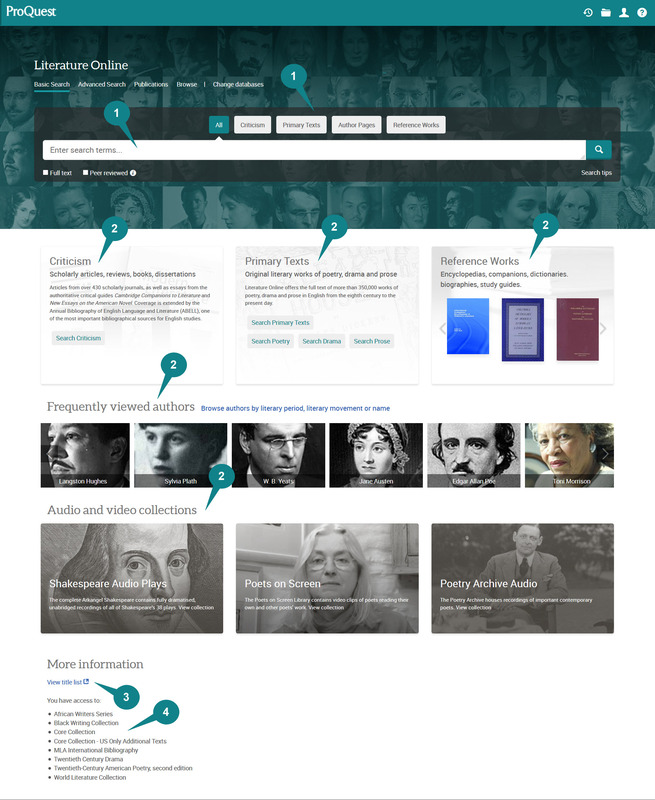 For Audio and Video collections, click Shakespeare Audio Plays, Poets on screen or Poetry archive audio to search or browse the collections. 3. Click Title list to download a spreadsheet containing a list of all content in your institution LION subscription. 4. This part explains which LION collections your institution subscribes to. Click here to read more about the available collections.